“Municipal Darwinism” is what the fascist ruler of a mobile London calls his attacks on smaller cities. In Mortal Engines, where an apocalypse some 200 years ago rendered basic civilization a void, people cluster together in roving towns on wheels. Some live in the air. Others still prefer things the old fashioned way – anchored to the ground. In another movie, the municipal Darwinism phrase might hold weight. A movie, say, less literal in its depiction of fascism and less a copycat of George Lucas’ later Star Wars prequels. 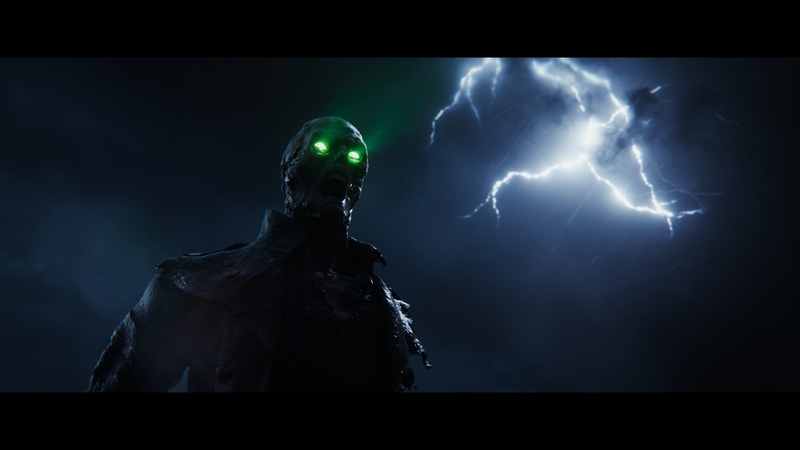 Mortal Engines is so doused in allegorical content, so muddied by visual effects, and so familiar a story as to make the entire thing anguishing to sit through. Maybe Mortal Engines represents France’s expansion under Napoleon. That’s giving this flat script too much credit however. 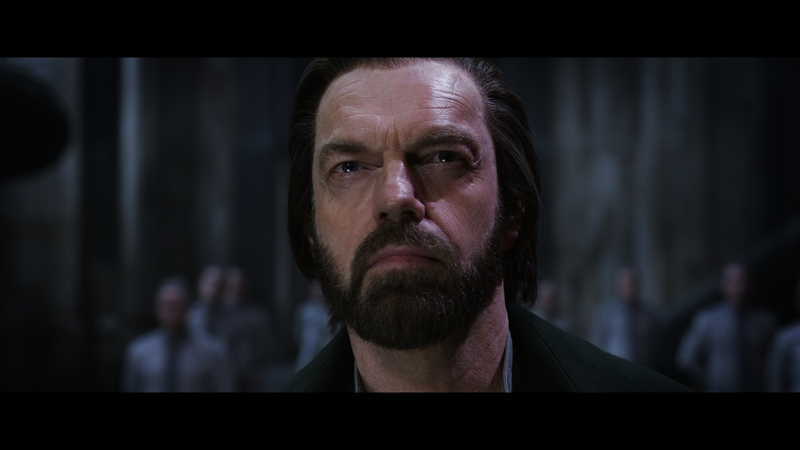 Hugo Weaving stars as the publicly charismatic, power hungry leader of London. In a world where fuel reserves dwindle, someone had the idea to build improbable machines of miles-high scale that wheel around on fuel-powered engines. Not smart. But fine – it’s a metaphor for those leaders who once sought expansion through military might. 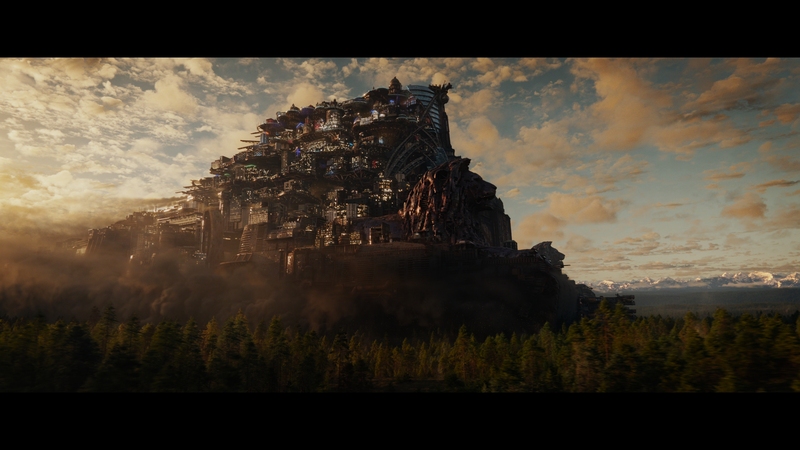 In Mortal Engines’ opening scene, London quite literally swallows a small town, then later shreds it with massive chainsaws, as if Mortal Engines didn’t already have the subtly of a tank. This brutally direct story finds its flawed hero in Hester Shaw (Hera Hilmer), the rebel with a damaged past and scar on her face. She’s out to bring down London, or specifically Weaving’s Thaddeus. It’s a personal grudge. If the meandering first hour isn’t enough bland heroism, the second devolves into grueling computerized spectacle. Hilariously, as if not recalling Star Wars enough, the finale is a stand-off between London – the Death Star – and a small band of pilots – the Rebels – trying to shoot the core before London fires a super laser. It’s all so routine, and of course an Asian pilot is forced to commit to a kamikaze run. Mortal Engines reaches a level of appalling predictability as to descend into racist caricature. Intricacies of this world feel shuffled off to side. In one instance, handlers of a museum discuss how they feel minimized and their attractions abused by those in power. That such a city even has space or care for a museum is bizarre enough, but that idea of caring about the past in apocalyptic circumstance never finds a foothold in the story. It’s just a piece to funnel into the greater, mundane arc that’s been done. A lot. Anti-fascist media in back in vogue and important, but not when it dribbles out in such an imitative manner. Shot for visual enormity, the 4K source here is often dazzling. The levels of sharpness, fidelity, and clarity earn a reference grade. Close-ups produce facial definition at levels rarely seen. Visual effects earn their wow factor, although a touch of aliasing does slip in at times; CG is rendered at 2K, and the upscale becomes visible. That’s ultimately minor. Splendid levels of color dot the scenery. 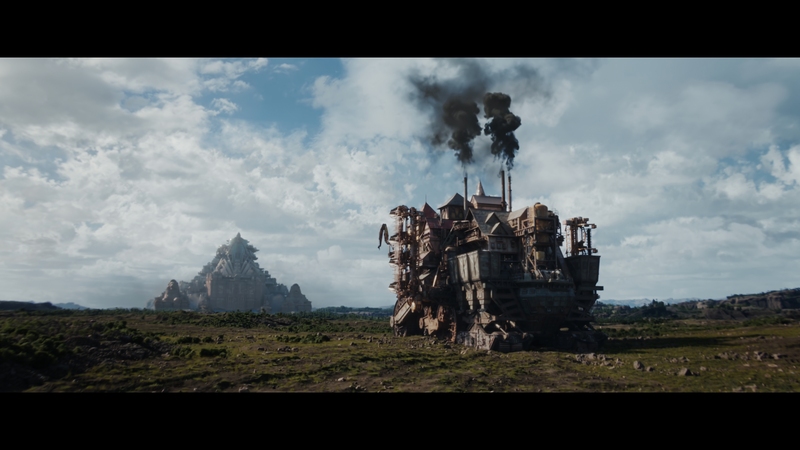 From the remaining greenery to the lush costuming, all of Mortal Engines splashes primaries. Graded with both cool and warm hues, neither style diminishes the vividness. With a Dolby Vision pass, contrast blossoms. Fire looks sensational. Sunsets push plenty of brightness. London’s massive laser weapon sends blinding electricity crackling around. Black levels sink deep, gaining a hold early on and never losing their fervor. Depth is marvelous and dynamic throughout. Perfect, even, like most of this presentation. Universal’s logo is bombed by explosions and world-altering blasts, setting off the subwoofer that rarely slows as Mortal Engines (literally) rolls along. Engines and tank treads dig deep into the low-end. Every time they pass – and they do so a lot – the LFE powers up with rich dynamic range. Given the intended scale, the subwoofer steps up to match the visual scope. Surrounds maintain the same level of activity, always on and careful to place objects around the soundstage. Cities sound alive, with minor elements like footsteps and doors closing pushed into appropriate channels. The finale mixes it all together, with booming explosions and rear channels picking up flying ships scattering about the field. Also reference, like the video. Director Christian Rivers provides a commentary, discussing his first time behind-the-camera. 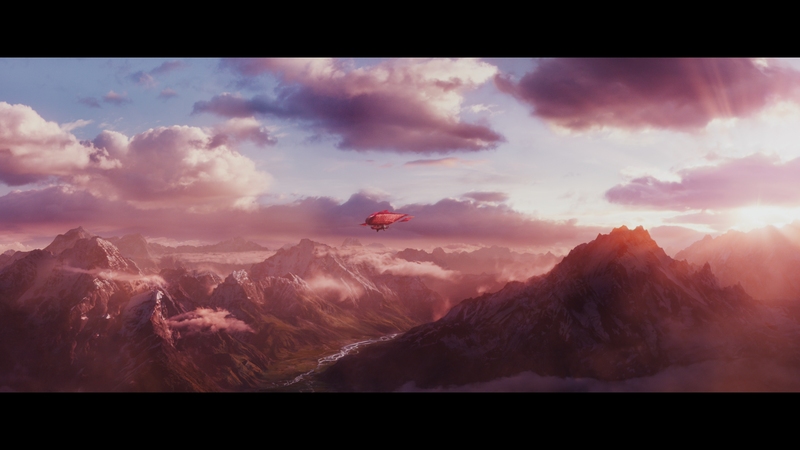 A 26-minute making of focuses primarily on Mortal Engines’ design splits into five parts, involving all manner of people, including Peter Jackson. It’s detailed, with gobs of production art and insight into the creative process. 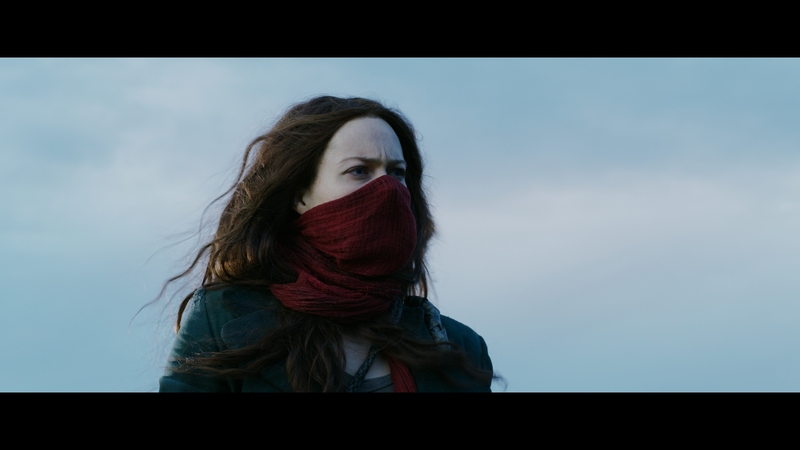 In a parallel universe, Mortal Engines might be a unique sci-fi adventure. In this universe, it’s a derivative knock-off with over extended visual effects. The following six screen shots serve as samples for our Patreon-exclusive set of 56 full 4K screen shots grabbed directly from the UHD.